More government action is needed to address the retirement crisis before coming generations fall off the precipice. Boston, February 21, 2018 – The U.S. retirement market has US$27 trillion in assets, with more than 80% of the household wealth held by those over the age of 50. 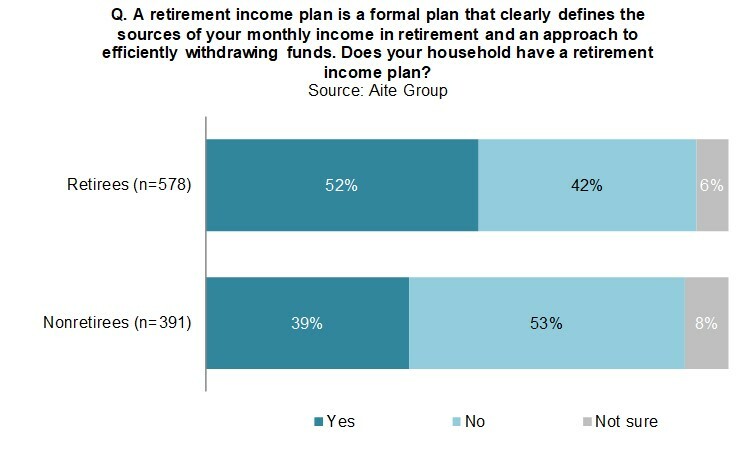 For the majority of the U.S. population, retirement funds are severely deficient. An inert government makes it clear that individuals must take greater ownership of their future, but many people, old and young alike, focus on their daily needs without a careful future financial plan. This Impact Note separates nonretirees (within a decade or so to retirement) and retirees and examines their sentiments, expectations, and actions—and for the latter, their experience in retirement. It is based on Aite Group’s online survey of 1,001 U.S.-based consumers between the ages of 55 and 75 with at least US$100,000 in investable assets as well as Aite Group’s online survey of 290 U.S. financial advisors, which included several queries on advisory fees and the sales of guaranteed income products. This 45-page Impact Note contains 40 figures and one table. Clients of Aite Group’s Wealth Management service can download this report, the corresponding charts, and the Executive Impact Deck.